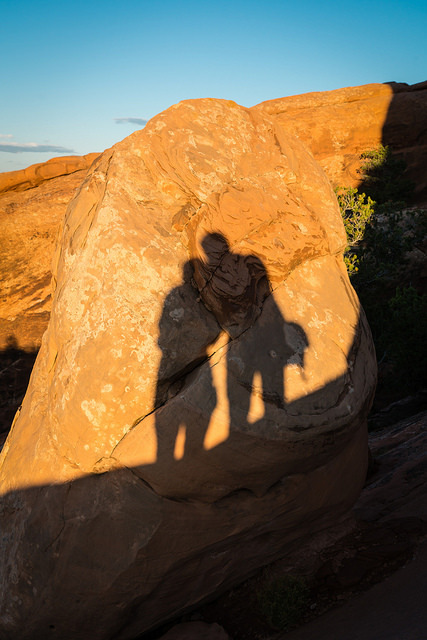 The sun was falling on the primitive trail of Devil’s Garden in Arches National Park in Utah. The sandy trail was damp from heavy rain the day before, but the sky was bright and blue above. The last traces of golden hour set the massive red rocks around us aflame. We could turn back and repeat the scrambling and climbing that brought us to our current place or we could go forward on the loop, which looked sandy and tame. 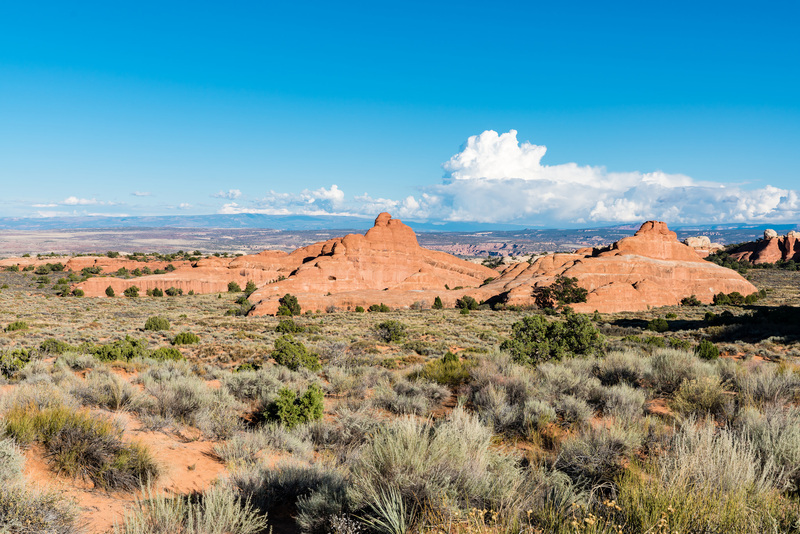 We had read that the primitive trail was a 3.5 mile loop– we thought from the trailhead. Rather, it was from the main trail. So when we chose to keep going on the easy-looking sand, it was for several more miles than we bargained for. The sun dimmed, and the sand yielded to climbing and rock scrambles. Arches rock is sandstone called slickrock. 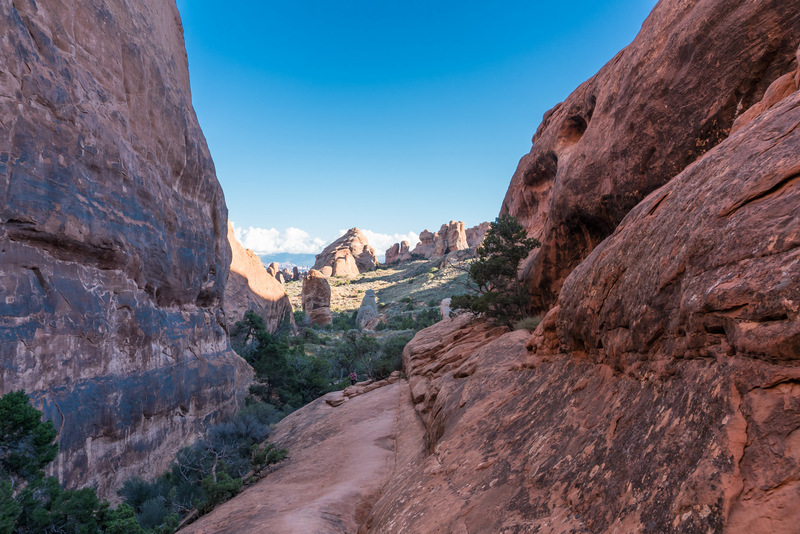 At Arches National Park, people crawl and climb over every arch and rock fin. It can be a challenge to photograph an arch without including some neon-clad idiot. So normally slickrock isn’t slick. But the rain-damped sand stuck to our shoes and acted as a lubricant, like sand on a shuffleboard table. We chose the sandy path because the rocky path to this point had been a challenge. And with even less chance of turning back, we were facing it again. At one point, we slid down a 10 foot slope into some branches at the bottom. If you missed the branches, your slide would be longer and steeper. There were other shorter slides. It was like nature’s playground. Then we came to a point where you must cross a ledge above a drop off. By ledge, I mean a slight bowing in the side of a rock fin. Twilight was setting in. My husband scooted across and warned me that the ledge was slick. I sat down and scooted, my camera bag bulging over the drop, skewing my center of balance. I inched along. My foot slipped. I darted forward, not at all steady. I was across the ledge. I looked back. If I had slipped, I would have slid rather than fallen, but down a 20 foot, 60 degree incline with prickly trees at the bottom. I imagined myself trapped in back country with a twisted ankle and no food and water for a night. It seemed less like a playground then. Night fell. Thankfully, it was a clear night with a bright moon; our only other lights were the flashlights on our iPhones. There were more scrambles, though none as bad as the ledge. The trail was marked with small piles of rocks. At one point, we missed a pile marking. We turned down a canyon. It was easy and first, and covered with footprints, a good sign. But it grew narrower and rockier, and the footsteps disappeared. I slipped and banged my camera bag. Yesterday, I discovered that I dislodged the front glass piece on my favorite lens with that jolt. Humph. The canyon ahead was even narrower, and we wondered when we last saw a rock pile. We back-tracked. At the entrance to the canyon, we saw the rock pile. We had been lost, but we were back. Unfortunately, the marker lay beyond a massive puddle. At least in back country Arches, we were pretty confident that there wasn’t much living in that red muddy murk. The puddle was surrounded by steep rock–we hoped it wasn’t too deep, opaque as it was. Tree branches poked up from the water. We hoped they were sitting on the bottom rather than floating, but it was hard to tell. We tried to scoot around the periphery. My husband slipped. The water was up to his knees. We waded through, grateful it was that shallow. Finally, the trail settled down, and we walked through a grassy prairie. 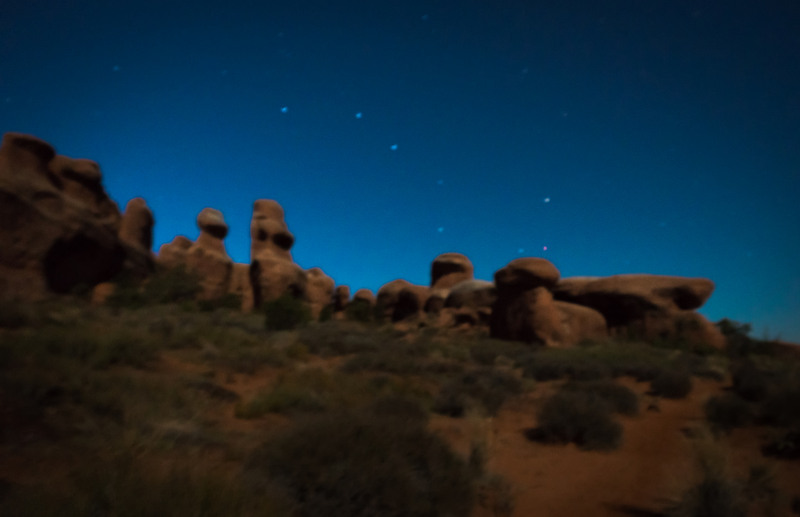 The stars came out; the milky way stretched over red rocks and prairie. Here and there, a shooting star flashed. We walked stiffly back to the main trail. Then we drove to Moab and got sushi, a bit more sandy than usual, our shoes still squishing with water. It was a victory meal. It was a good adventure. We didn’t slip or fall and the pictures turned out beautifully. Next time I’ll be more careful reading the distance markings, though, and respect slickrock after rain. The rest of my shots from that day are on Flickr. Other than my pitfalls, mostly caused by my lack of caution, I’d highly recommend this hike. I felt very wild and saw such beautiful things. The view after all that twilight struggle, a hand-held star shot. A pretty delightful reward. Fins of red rock. Later we got a little lost amongst all those massive parallel slabs. Partition Arch in Devil’s Garden. 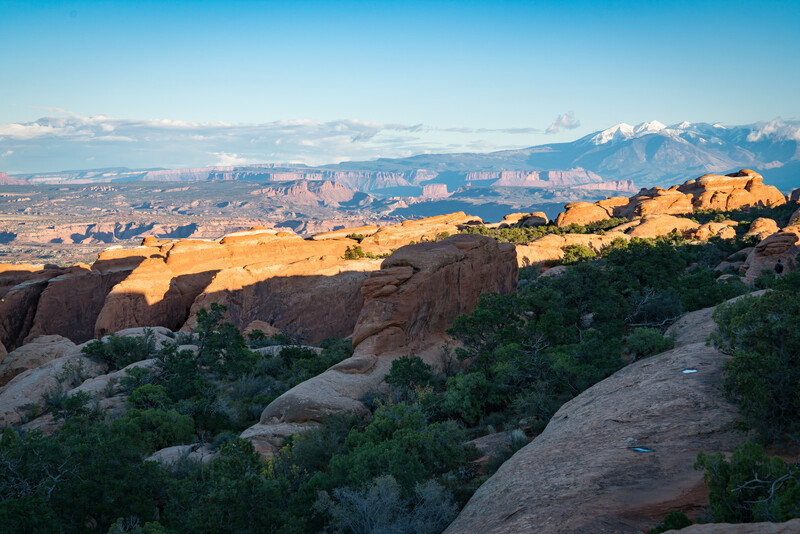 The red rock fins and the La Sal Mountains. Though I didn’t love the night hike, I’m so glad for the gorgeous golden hour shots I got. 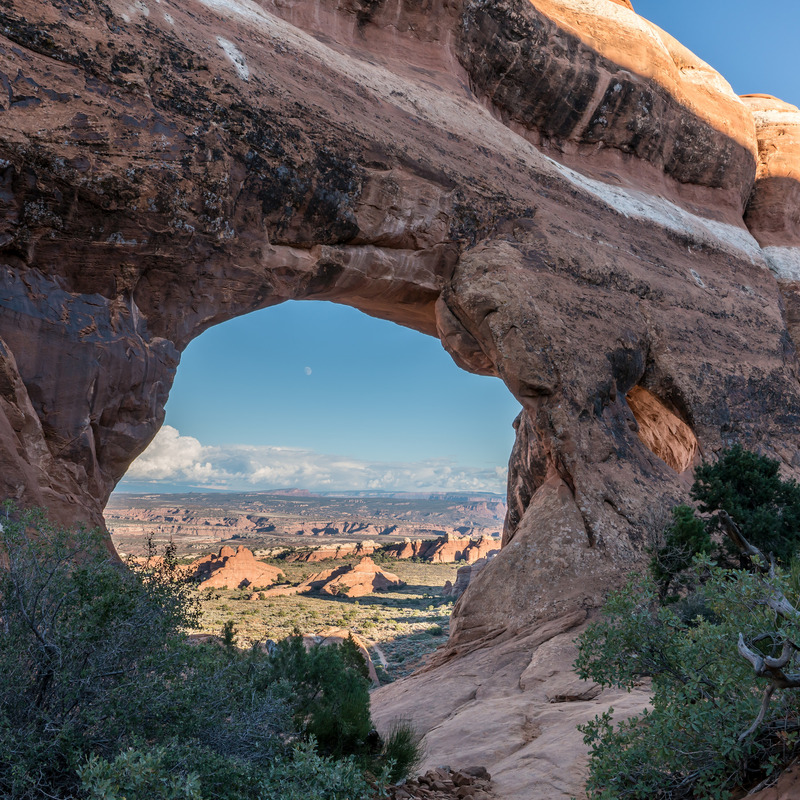 Double O Arch, just before we went off onto the primitive trail. I’m so glad I got to see it in such a beautiful state. 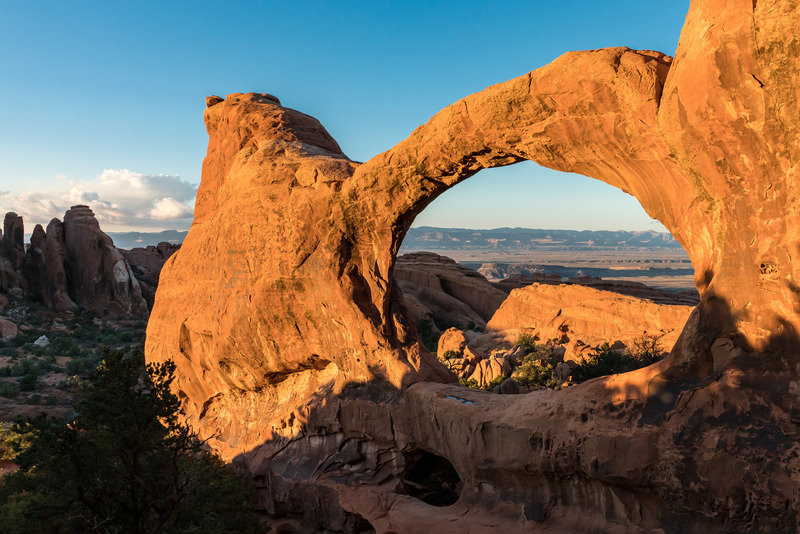 This entry was posted in Photography and tagged american west, arches, arches national park, devil's garden, hiking, moab, national park, outdoors, photo, photography, sandstone, sandstone arches, scenery, slickrock, the west, utah, west on November 2, 2015 by Vironevaeh. we got lost here last night. our 7 mile hike ended up being 20 miles with a search and rescue in the 20 degree cold pitch black night.